School auditoriums are designed with a focus on the auditory sense and rarely offer any visual stimulation (Maybe that’s why they’re the venue of choice for Protestant congregations looking to rent space for worship). Thus it was a pleasant surprise for conference participants entering Fuller Seminary’s Travis Auditorium to encounter Olga Lah’s installation entitled Release. As soon as they came into the room, their eyes were drawn to the luminous curtain on the opposite wall. Radiance was reflected off white flowing strips within the dark and dimly lit auditorium. The installation could not be ignored as it voiced its presence in the silent room. The occasion was the third annual Asian American Equipping Symposium (March 19-20, 2012) co-sponsored by the Institute for the Study of Asian American Christianity (ISAAC) and Fuller Seminary. With this year’s theme ‘Healing of Memories’ ISAAC’s executive director and co-founder Dr. Young Lee Hertig felt that it would be fitting to conclude the symposium with a closing worship service as a means of experiencing God’s healing grace. Korean American Fuller alumna and installation artist Olga Lah was commissioned to visually enhance Travis auditorium as an environment for worship. Olga’s installation was made on site. 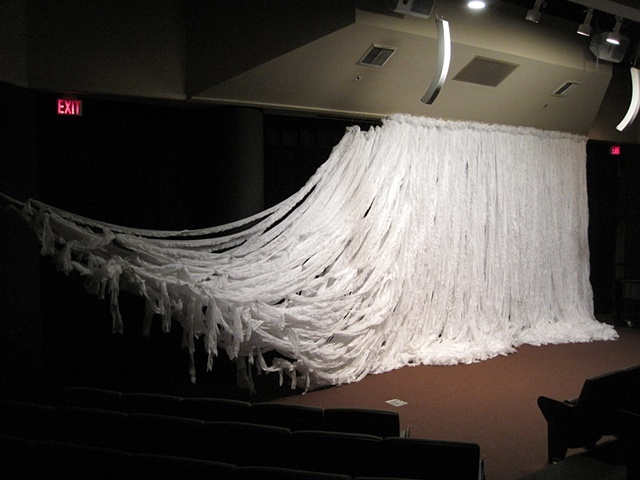 The artwork consisted of a large number of three inch-wide white polyester strips cut to about 20 feet in length each. 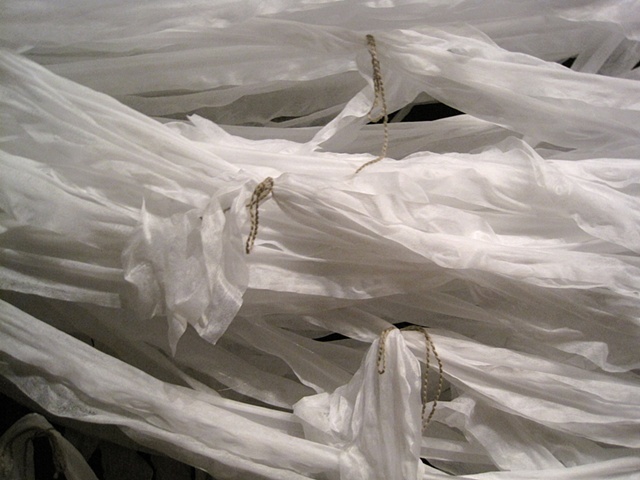 The polyester strips were stretched side-to-side by volunteers to create a unique ruffled effect. Clusters of the white strips were then stapled along the top of the proscenium. Most of the strips rested downward with excess fabric gathering into mounds on the floor. The ‘curtain’ had strips that were suspended by fishing line and twine toward the left side, resembling inverted arches. During the closing worship service Release was incorporated as one of three prayer stations. The other two stations offered space to reflect upon and write prayers in response to experiences with ‘Family/Culture/Growing Up’ and ‘Church and Faith.’ As liturgist Russell Yee presided and violinist Corrie Covell musically accompanied, participants were asked to visually engage with Olga’s installation. They tried to describe their emotional response with words. Some spoke of a waterfall, others of a wedding gown. The responses were as diverse as they were numerous. In speaking of her own work, Olga shared how she simply wanted it to provide a reflective space. The theme of the symposium was healing. Various speakers shared about personal moments in their past which lingered into painful memories. Through long processes of prayer and counseling, healing had been possible for them. With this in mind there was a strong resonance for participants with Olga’s installation. Unsurprisingly Olga revealed the inspiration of her work was personal ‘stories of brokenness and healing.’ Read from left to right Release offers a narrative of the Spirit’s healing work from divided tensions to freedom of rest under pierced grace. The symposium manifested how destructive events can cause persistent wounds. Yet Hans Rookmaaker could say to artists of faith, ‘Christians are called to be the salt of the earth, to preserve and add flavour to what is good, and to bring a measure of healing where people are sick and broken’ (The Creative Gift). It is this gift and calling for Christian artists to assuage wounds by providing a moment in space and time for enduring effects of healing and restoration. 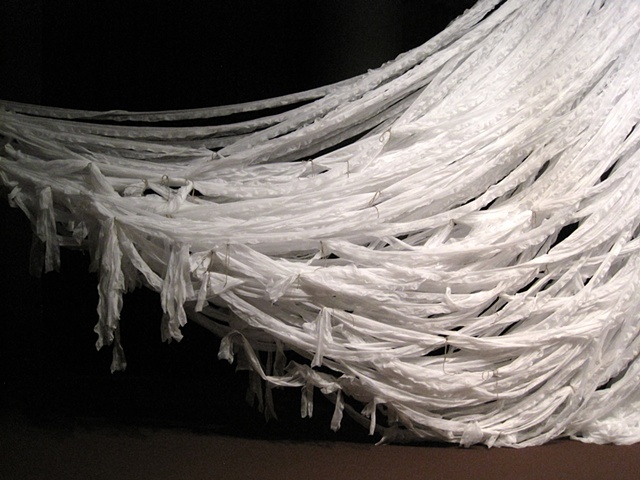 Olga Lah: Release, installation, polyester, 2012. Olga Lah was born and raised in the Los Angeles area and now lives in Long Beach, California. She received a double BA in Studio Art and Art History from the University of California at Riverside in 2002 and a MA in Theology from Fuller Theological Seminary in 2006. She is an emerging artist working mostly in site-specific installations and sculpture. She exhibits regularly in solo, group and juried shows, most recently showing at the Torrance Art Museum and Gallery 825 in Los Angeles. She has also worked on two public installations for the Pasadena Playhouse District Association. She is a twice recipient of a Getty Multicultural Intern Alumni Fellowship and a recipient of a supported residency at the Can Serrat International Art Center in Spain. S. Edward Yang is a second generation Korean American. He is currently completing his Ph.D. in Theology and Culture at Fuller Theological Seminary. Prior to this Edward studied at Regent College (Vancouver, Canada) where he wrote his thesis on Hans Rookmaaker. He is also in the process of being ordained with the Presbyterian Church (USA) as a Minister of Word and Sacrament. For the past year he has been serving as the Associate Director for the Institute for the Study of Asian American Christianity (ISAAC). Edward and his wife, Sunnie, with their three young boys live in Pasadena, CA, USA.